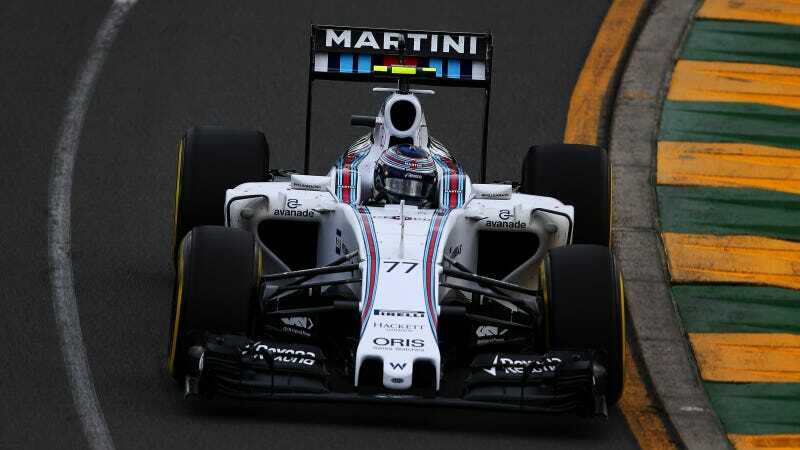 Tissue damage has sidelined Williams Formula One driver Valtteri Bottas for the Australian Grand Prix. The FIA just announced that Bottas has been declared unfit to race today. Bottas qualified sixth, but was complaining of back pain after the qualifying session. Bottas was visibly uncomfortable as he walked back to the paddock. According to RACER, doctors found soft tissue damage in his lower back to be at fault for the pain. Claire Williams told Sky Sports that Bottas suffered an annular tear in a disc in his lower back, with pain first appearing during Q2. The tear was not triggered by a bump or anything in particular, and doctors working with Bottas explained that tears like these can happen at any time, while doing anything. Bottas stayed overnight in a hospital for treatment and observation and worked with a physiotherapist before meeting with the FIA this afternoon about today's race. Many F1 talking heads (including Will Buxton) suspect that Bottas' ability to get out of the car in the event of an accident was a major factor in the FIA's decision, even though the FIA have not stated that in particular. Claire Williams confirmed to Sky Sports that Bottas performed two extraction tests for the FIA. He passed the second test, but failed the first part of the first test. The Williams team said in a statement on their web site that they "will now work with Valtteri ahead of the Malaysian Grand Prix to ensure he receives the treatment required to get him back to full fitness." Claire Williams was unable to give any sort of recovery timeframe to Sky Sports when they asked. We will keep you updated as soon as we hear more on this story, such as whether reserve driver Susie Wolff will take Bottas' seat for the grand prix, if another replacement has been lined up, or if the team will park the car for the weekend. UPDATE: Wolff cannot fill in for Bottas per the rules which state that a test driver must have driven at some point during this race weekend for them to fill in during a race, so the car remains parked. I've heard a lot of silly rules come out of F1, but this perhaps takes the cake. If the team is okay with her driving the car, who cares? If you've made it to Formula One, there's a general expectation that you're not a novice driver and you should be able to go out on track all by your onesies during a race and pick the track layout up (which you've presumably been driving on simulators anyway) relatively safely. The latest entry list had only seventeen cars, yet Kevin Magnussen's McLaren Honda power unit failed and Daniil Kyvat's Red Bull gearbox has failed as well. The starting grid will likely consist of fifteen cars.